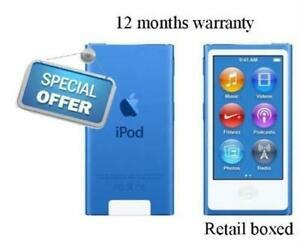 Apple iPod nano 7th Generation Blue (16GB) Good Condition! Fast Delivery! Apple iPod nano 7th Generation Blue (16GB) Great Condition! Fast Del! Apple iPod nano 7th Generation Pink (16GB) Battery Issue! Fast Delivery! 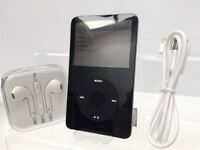 The Apple iPod nano 7th Generation can store 4100 songs using its 16 GB built-in storage capacity. Its 2.5-inch display makes it easily navigable. You can save different playlists to suit your mood or play songs according to their genre. Lightweight in construction, this Apple nano can be easily carried along with you. Overall a great iPod with good features and design. The iPod nano 7th Generation is a nice little iPod. The style and design of the iPod is nice, the iPods light weight and easy to use with one hand on the move. The pedometer feature is a creative touch to the iPod and can be left on for any given set of time. The only problem I faced occasionally was that I could swipe across to go back on the first swipe it sometimes took several swipes but this may be because i'm left handed. Be careful with the screen as it is quite large in comparison to the iPod and is easy to scratch or break. I recommend getting a case and a screen cover for the iPod. I bought the product as I needed somewhere to store my music after my iPod classic broke. This model is really good, i thought 16gb wouldn't be enough after being use to the 80gb classic but making a playlist of a few selected songs that I enjoyed the most was easy as 16gb is more than enough. Overall a great iPod with good features and design. Bought for my octogenarian mother to replace a CD player, used with a docking station, this is used constantly as background. Easy to understand menu, touch control makes using it a simple affair. Although a used product, it looks like new. The blue tooth capability is a real bonus. Very pleased with my ipod 7th generation from Apple, to compliment it I also bought the new Apple bluetooth Airpods, very pleased with the performance from both, expensive yes, but I have no regrets, this is my first ever purchase of an ipod and earphones, and at 76 years of age I can now enjoy my music collection wherever I go.